New Deer St Kane's and Maud and Savoch Church have been linked with M'buka CCAP, a church in Malawi since 2011. This is a chance for all three congregations to learn from our different experiences, share fellowship together and grow in faith in a worldwide community. There have been several visits from and to Malawi since the twinning came to fruition. A member of St Kane’s congregation, Josephine Breton has spent a great deal of time in Malawi. Working in the local school she immersed herself in the daily and spiritual activities. Below is a timeline of visits from congregation members at St Kane's and Maud and visits to Scotland from members of the Malawi congtregation. This is to update you that we have had a very good Easter revival meeting from 14th to 16th April, 2017. During the same ceremony on Sunday there was official signing of Our Partnership of which your side was represented by Josephine. About 4000 Church members were in attendance on this signing occasion. We hope God will continue blessing this partnership according to His will. Some photos taken on this event are attached. Picture above: Knitted baby clothes by Gail Castle (member at St Kane's, being delivered to Bwaila Hospital. I am praising God for giving me the huge gift of spending 2 years at M’buka CCAP in Malawi. I was working as a volunteer teacher at their church primary school. For the first 9 months I lived with 4 different families. It was a privilege to experience Christian Malawian hospitality first hand. From October 2014 I stayed in the guest house within the grounds of the Manse, which is in the church compound. I was safe, comfortable and well looked after by the Reverend and his family, the church staff and community. The school is also within the church compound, so it was handy for work! Lessons for seniors can start at 6.30 am, but the main school opens at 7.30 am. The little ones stop at 12 noon, but the seniors can even continue until 4 pm. Standard 8 sometimes study on Saturday mornings. And in that heat! I had to pace myself! The teachers were sympathetic! I would like to thank St. Kane’s, Maud and Savoch Churches and the wider community for all your huge assitance with this project. From the initial planning, throughout the duration of my stay at M’buka and now on return to New Deer, I have been supported by you all with extensive practical assistance, advice, encouragement, gifts, prayers. I would never have been there without you! While I was at M’buka we were blessed with many visitors including Anne Melia, with Jan Sanders, Wilma Mutch with her sister Sheena, Anne Linton, Sandra Jackson, Melissa Castle, Ross Penny, Laura and Joanne Linton, Elsie, Caitlin and Ethan MaCrae. Each one brought their own gifts and talents. The people of M’buka were overjoyed to receive you and you were a huge help to me. Living and working within the church compound, I experienced the full force of M’buka CCAP! Activities include Morning Devotion at 5 am Mondays to Saturdays, 3 services on Sundays, all night prayers at the end of each month and for special occasions, preparation services on Saturdays before Communion, Sunday Schools, fundraising events, revival services, prayer groups on Wednesday and Sunday afternoons, at least 6 choirs practising twice a week (sometimes simultaneously! ), Women’s and Men’s Guilds and their related activities, wedding ceremonies and receptions, catechumen classes, meetings of all the committees, Bible Study classes in English and Chichewa, frequent visiting preachers, counselling groups, Youth Team sports and music groups, Old Guys Football Team, Ladies Netball team, classes for engaged couples. So, it’s busy place! On a daily basis I was humbled by the Malawians of all ages, both children and adults: their unbelievable physical and emotional strength, their willingness to forgive and to accept criticism, cheerfulness even in extreme adversity, gratitude for life itself. They speak naturally about God their Creator and Jesus their personal Saviour. They read their Bibles freely in front of each other, even at break time in school. Prayer is included throughout the day: morning and evening, before food, beginning and end of school and church meetings, before and after journeys, on welcoming and parting. I was at M’buka CCAP for births, marriages and deaths, successes and failures, during highs and lows. Despite our differences of language, education systems, culture we shared our experiences. Tiyamike Ambuye! Praise God! 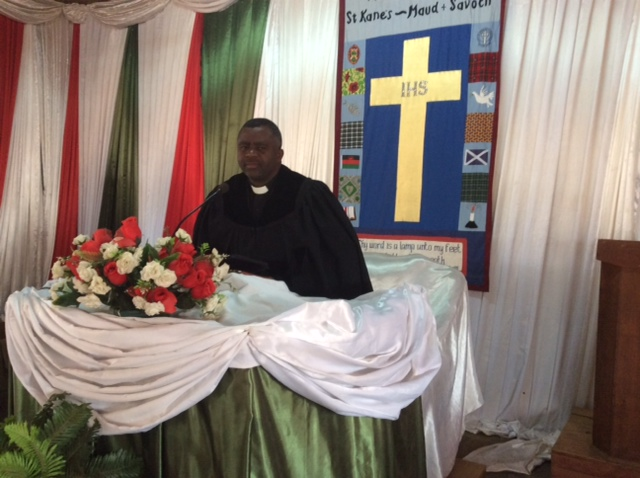 We were blessed with a visit to St Kane’s from Mr Yowass Nkhoma and Mr Pope Mzumara from our twin church in Malawi. During their visit they shared in our weekly Sunday service and met many different people from within our congregation and local community. This followed on from a visit in 2013 from Fred Thomson and Salmone Jere to the North East of Scotland. They, like Pope and Yowass, took part in our church services along with many activities around the church, organised for their visit. 2015 saw some young members and leaders visit Malawi and our twin church M’buka CCAP. This was a wonderful experience for all involved, gaining invaluable insight into faith and sharing fellowship with our friends in Malawi. They also helped in the local school. In 2012, Jan Sanders, a member of the congregation from Maud and Savoch Church went to Malawi for six weeks taking parting in the Guild and Sunday School. She also visited several hospitals and schools as our congregation try to learn of life in Malawi. The biggest link between our churches has been through Josephine Breton who has recently returned from two years in Malawi. Working as a music teacher in a local school it has given Josephine a fantastic insight into life and work in our twinned community. The hope is that the link will allow us all to learn from one another in faith and we hope we can help those in the country who need it most.